3600 Build Your Own House is a Creator set that was released in 2005. 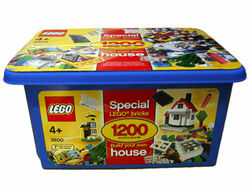 It comes in a large, blue tub and includes "special LEGO bricks." It also includes a small idea book and seven ideas to help the user create things with the given pieces. The set includes 1200 pieces. This set is recommended for children aged 4+. Facts about "3600 Build Your Own House"
This page was last edited on 3 May 2016, at 00:35.